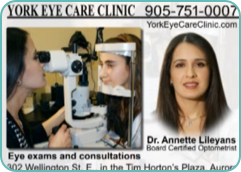 At York Eye Care Clinic our number one priority is to perform the most comprehensive eye examination providing you the best possible prescription for eyeglasses or contact lenses and to diagnose and treat ocular diseases. Our vision care service also includes refractive laser surgery consultation and co-management. It is our mission to provide the most thorough care to each and every patient. We strive to always provide you with the best service, most current information and education and the best products on the market. For your convenience, our new and modern optical dispensary carries a large selection of designer and value eyewear. Our staff will provide exceptional customer care to meet and exceed your expectations. We are conveniently located in the Aurora, Newmarket area at 302 Wellington Street East in the Tim Horton’s plaza across from St. Maximilian Kolbe Catholic High School. Complete vision care that's focused on you!